The loveable fat man from Goodfellas who meets an untimely death at the hands of Joe Pesci. He just wanted his money. He was just breaking Jimmy's balls a little bit. But who loves you more than Morrie? Goodfellas, directed by Martin Scorsese and starring Robert De Niro, Ray Liotta and Joe Pesci has become the classic mafia movie. Here we have a fully authentic t-shirt promoting Morrie's wig shop, inspired by his wonderful television ad. 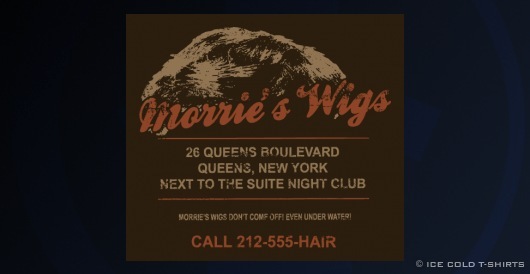 Morrie's wigs are built to withstand hurricane winds!